(Toronto, Ont.) On the day that Team Canada’s youngest player celebrated his 17th birthday, the Canadian Men’s Wheelchair Basketball Team bounced back from an upset loss the night before gift-wrapping a 76-58 victory over Argentina. With the win Canada’s record improves to 3-1 at the 2015 Americas Wheelchair Basketball Challenge. One crucial game remains for Canada against rival USA in the friendly warm-up tournament that offers a sneak peak at the top competitors gearing up for the Toronto 2015 Pan/Parapan Am Games. Canada’s Adam Lancia made his veteran presence felt leaving his mark early in the game with a momentum shifting three-pointer. It would be the first of his game-high 21 points. Fellow London 2012 gold medallist David Eng came on strong in the second quarter making good on six attempts from the charity strip. He would finish strong with 19 points for the Canadians. On the opposite end of the experience spectrum Team Canada benefitted from breakout games from rookies Deion Green, who tallied 14 points, and youngster Liam Hickey who celebrated his birthday with a flawless shot from just outside the paint for two points on the night. Canada outscored their opponent 23-11 in the third quarter and rode the momentum through to the final buzzer despite the constant scoring threats of Sergio Vera Peralta and Daniel Copa who finished with 14 and 12 points respectively for Argentina. The highest scoring game of the night also proved to be the closest when, hot off their lopsided defeat of Canada on Tuesday, Brazil pushed USA to the brink. It took the Americans nearly the full forty minutes to outscore the Brazilians 82-76. It was back-to-back clutch free-throws by Jared Arambula in the final seconds that iced the game for the USA. He finished with a game-high 20 points, one better than Luciano Da Silva who led Brazil with 19 points. Team Canada will wrap up their competition against rival USA on Thursday March 26th at 6:15 p.m. ET; the team they have faced in the finals at three-out-of-the-four previous Parapan American Games. Team USA hold a slight historical advantage having won the tournament three times (1999, 2007, and 2011) to Canada’s sole Parapan American Gold performance in 2003. 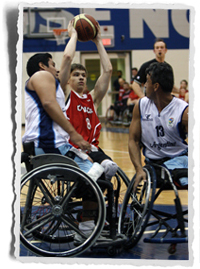 Most recently at the Parapan American Games, Canada took home bronze in 2011. Interviews with Team Canada athletes and coaches can be scheduled by contacting Jody Kingsbury at 613-851-2337 or jkingsbury@wheelchairbasketball.ca.